Click here to see the Quests. Wiki says.. A battle pass is a type of video game monetization that provides additional content for a game usually through a tiered system, rewarding the player with in-game items by playing the game and completing specific challenges. In Rift, the battle pass system will be a series of additional quests that will award you with battle pass Experience (BPXP). There will be 30 levels of BPXP to make your way through, each level requiring 10k BPXP to complete. Each level you pass will have rewards attached to it. This is the price for the entire battle pass Season 1, not a monthly cost. The battle pass cost is actually very small and in line with other battle passes seen in other games. If you manage to get all the way to level 30 then the price of the battle pass is very clearly a good deal! You will get a mount, costume items, unique cosmetics, 1500 Credits, 160k Loyalty (If you have Patron too) and a large selection of other premium items. Even just a singular mount alone would normally cost more than the entire battle pass.. but of course, with the battle pass system, you will have to work for that mount! You can buy the battle pass at ANY POINT during the season.. so if you want to you can play the game for a while, try some of the dailies/weeklies and figure out if you feel you can get to a high enough level for the rewards you want. When you buy the battle pass mid-season you will be able to claim the rewards from the levels you have already completed, so you wont miss out on any of the rewards. You can see the battle pass announcement thread on the forums here. A battle pass season will generally last 2 to 3 months. 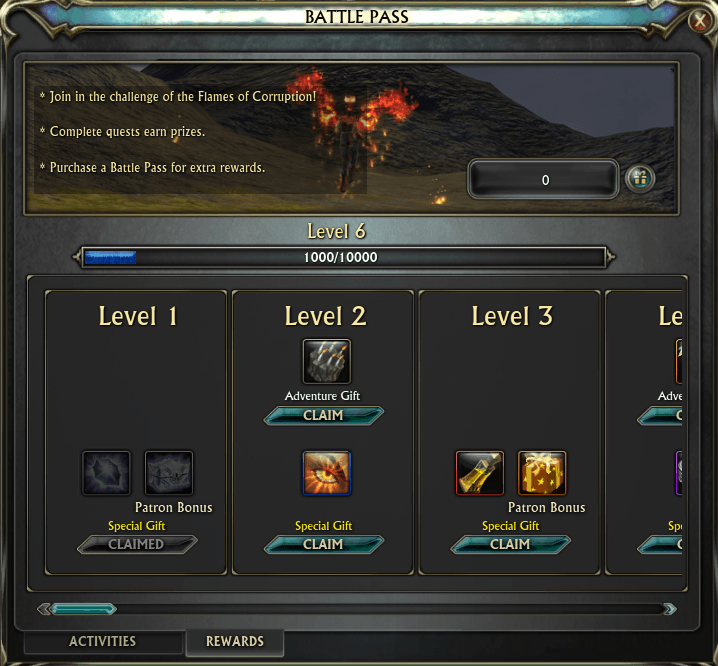 As this is the first battle pass in Rift, there will be a huge learning curve for the Devs, they will be watching our progression closely to see what we enjoy doing, what we don’t enjoy doing and how fast our average progression is. The devs have not decided on an official end-date yet, instead they will be monitoring how fast we progress through the levels and adjusting/tweaking as they go to ensure that as many people as possible who buy the pass have the opportunity to complete it. They have said that Season 1 will last at least a ‘couple of months’. The Devs have said that we will definitely get one months warning before Season 1 comes to an end. Season 2 will have a whole new set of rewards to quest for. Each Season will have its own battle pass to buy. BPXP is shared across all your characters on the same region, so you can use different alts to complete all the dailies/weeklies. Be careful which character you claim your rewards on, a lot of them are BIND ON PICKUP, especially the cosmetic effects. (awaiting to see if Devs will change this to Bound to Account). Buying the Battle Pass will activate your extra rewards on both regions (you only need to buy it once), however you will need to earn the XP separately on each region to work your way up and claim all the rewards (BPXP is not shared cross region). Credits and Loyalty rewards can only be claimed once per account, it will credit on the first region you claim it on, when you reach the same level on the other region you will be able to hit the claim button but wont get the credits/loyalty. You can Key Bind the Battle Pass menu to open it quickly in game. There is no default key binding. 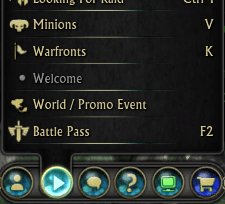 You will find Battle Pass in the Key Bindings menu at the end of the list of UI Toggles. You can also find Battle Pass in the main Activities menu. Use the Tabs at the bottom to switch between Activities and Rewards. 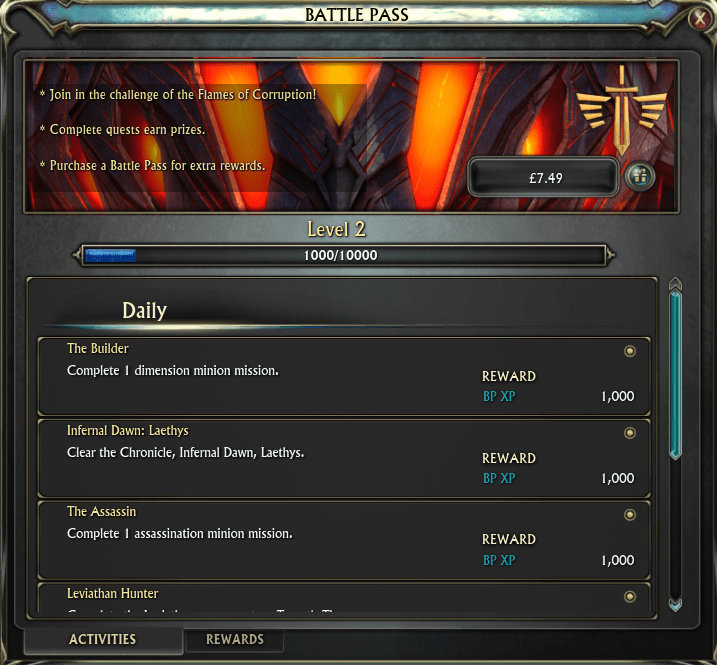 On the Activities Tab you can see your Daily and Weekly quests. When you finish a quest you claim the BPXP from this list. On the Rewards Tab you can see all the different rewards and claim the ones you have earned so far. You can also buy or gift the Battle Pass straight from this window.